At a two-day seminar held in Hanoi by the Ministry of Labor, Invalids and Social Affairs and the International Labor Organization, it was disclosed that almost 606 workers died at their workplace in 2012 across the country, a year-on-year increase of 10 per cent. Nearly 6,800 labor accidents were recorded last year in the country, resulting in losses and property damage of up to VND11 billion (US$528,000) and a total compensation amount of VND82.6 billion ($3,964,800). 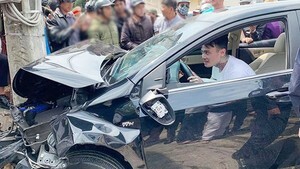 However, Bui Hong Linh, deputy minister of Labor, Invalids and Social Affairs, said the number of labor accidents could well be around 40,000 each year. The mining, construction and chemicals sectors have seen many labor fatalities which call for improved safety measures. Nguyen Thai Hoa from the International Labor Organization, said workers have to undertake jobs in poor safety conditions which result in occupational accidents. Labor accidents and related diseases are on the rise, especially in the mining sector.